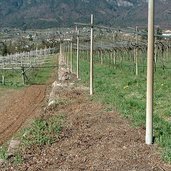 The South Tyrolean Wine Route is located in the south of South Tyrol and stretches from Terlano and Andriano to Salorno. Live webcam View on Oltradige and Bolzano. 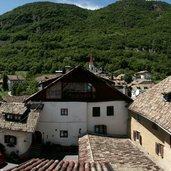 See panorama Great view from the roof of the accommodation Garni Gartenheim on Pianizza di Sopra. 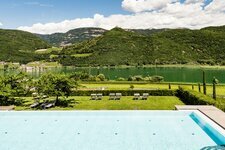 See panorama From the viewpoint in Castelvecchio (behind the church) you can enjoy a fabulous view on Lake Caldaro. 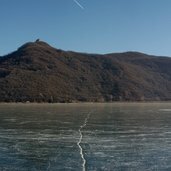 See panorama View from the Penegal on Oltradige, Lake Caldaro, Bolzano and Val di Non. 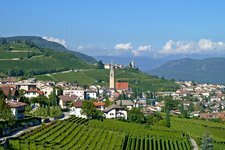 The area south and southwest of Bolzano is called South of South Tyrol. 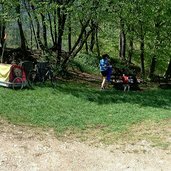 Here you can practise different activities all year round: cycling with racing, mountain or e-bikes, hiking enjoying both nature and culture, or enjoying the lakes of Caldaro or Monticolo. 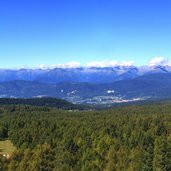 What is your favourite day trip in the South of South Tyrol? 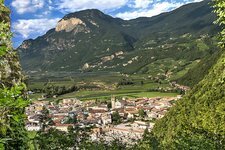 The favourable climate and the picturesque landscape, made of vineyards and apple orchards, make the South of South Tyrol an ideal area for enjoying unforgettable days. 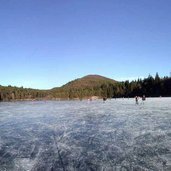 We have been at Caldaro and asked: why have you chosen to spend your holiday in this area? 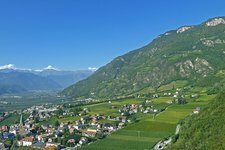 One of the main characteristics of the southern area of South Tyrol is undoubtedly its climate, favouring the growth of palm trees, cypresses and lemon trees in the Val d’Adige, the Bassa Atesina and the Oltradige, and not least grapevines and orchards. 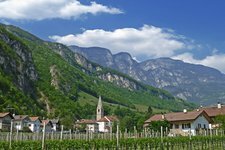 Recommendable to gourmets and oenophiles is the South Tyrolean Wine Route, connecting the villages in the bottom of the valley. 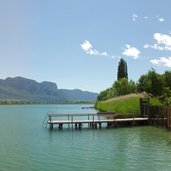 This is also where the warmest lake for bathing in the Alps is located, which is Lake Caldaro. Castelchiaro, the symbol of the area, reflects in its waters. By the way, the Oltradige is one of the richest areas in castles ever. 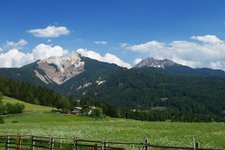 In marked contrast, however, the mountain areas of the south of South Tyrol: the Regglberg with the Monte Corno, Corno Nero and Corno Bianco, at their feet the Rio delle Foglie canyon dating back to the Ice Age. 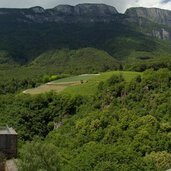 The Mendola mountain range and the Salto are further hiking areas. 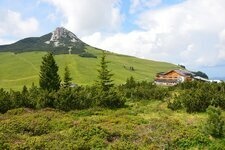 The municipality of Aldino extends on the low mountain range of the so-called Regglberg. 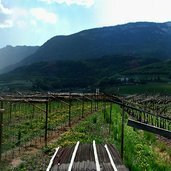 Ora, a wine village in the south of South Tyrol, allows to develop Mediterranean feeling. 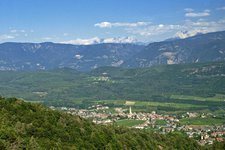 The idyllic village of Cortaccia extends on the sunny side of the Wine Road. Magré nestles in the heart of vineyards in the Bassa Atesina. The municipality of Montagna extends about 15 km in the south of Bolzano. 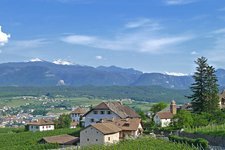 The municipality of Egna nestles in the heart of a landscape that is covered by vineyards. Terlano is a wine and apple village and is also known as the home of the asparagus.